Indirect Participants within the Great Conversation across the ages: Parsons, Weber, Marx, Vico, Heidegger, Marcus Aurelius, Plato, Held, Dawson, Santayana, Cesari, Voltaire, Dante, Petrarch, Schuman, De Gasperi, Dawkins, Derrida, Eco, Rawls, Croce, Giolitti, Hegel, Amendola, Einaudi, Ropke, Nietzsche. 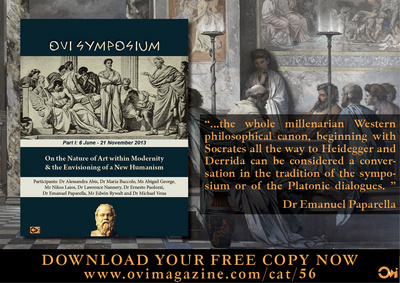 The sub-theme of this 63rd meeting of the Ovi symposium deals with a unique political phenomenon, modernity, or better what in the West is perceived and believed to be modern and progressive in our era, an era which begins with the appearance of modern science in the 17th century followed by the Enlightenment, philosophical positivism, and the debunking of movements and trends that precedes it, especially if medieval and including the ancient. Anything that is not modern, progressive, enlightened, that is not the newest and latest arrival on the stage of history is ipso facto gothic or medieval, regressive and obscurantist, so much so that what comes after modernity, post-modernity, is even more progressive than mere modernity. It is intriguing however that there seems to be only one modernity directly descendant from the age of Enlightenment. In section two Ernesto Paolozzi provides for the readers another useful paradigm for envisioning multiple modernities in the EU, namely that of the philosophy of freedom and liberalism of Benedetto Croce, who while usually not included in the list of founding fathers of the EU, is undoubtedly one of the great philosophers who laid the theoretical philosophical foundations of a novel post-World War II polity called the European Union. He asserts that for Croce freedom is not tied to any one economic system considered most modern and therefore most relevant, such as capitalism or communism, for example. In fact, the economy is not the only cause of history. To quote Paolozzi: “Many examples from Statist and social-democratic Sweden in the seventies, to free-trading and authoritarian Chile of those same years, prove that freedom is not necessarily tied to an economic system. Free-traders, in some ways, make Marx’s same mistake by absolutizing economy as the sole motor cause of history. On the other hand, there are no pure economic systems. There are only concrete political economies that are subject to the always new and unforeseeable conditions dictated by history.” That insightful quote reinforces Habermas’ thesis of multiple modernities. In section three Nikos Laios too deals with the issue of a corrupted democracy turning into and oligarchy or what the US founding fathers called “the tyranny of the majority.” The cartoon on top of his piece is telling. In the US we have a former president (Jimmy Carter) who has already declared that what seems to obtain now is a pseudo democracy to cover the fact that power is held by a few rich oligarchs, the one per cent of the super-rich; the same can be said for Russia and the EU. This is an intriguing but also complex thesis which in some way brings us back to Plato’s critique of democracy in The Republic mentioned by Laios as well as myself in a lengthy article on the issue which appeared in Ovi on November 7th. What Laios is articulating is the sad phenomenon of modern nations possessing all the trappings of democracy (voting, free speech, elections, etc.) but nevertheless remaining pseudo-democracies within which the people are unable to determine their own destiny. This is the other side of Plato’s critique which pointed out that when the will of an uninformed majority is observed and that of the wise philosopher king is ignored, then you may have a sinking ship of state on your hands, devoid of a captain and leading to the tyranny of the majority. Aristotle, on the other hand, believed that all things being equal a decision arrived at democratically would turn out to be better than that of one man or a few oligarchs. Moreover, the concept of “enlightened progress” which the Enlightenment introduced is philosophically problematic as Kierkegaard pointed out; it is problematic because in its implied determinism it seems to deny human free will. If progress is inevitable and unstoppable, then freedom is moot and of course democracy, which can only survive within a milieu of freedom, is also moot. It turns out that the Enlightenment has still to enlighten itself. hat the French or the American revolution envisioned as an harbinger of liberty, remains to be ascertained. Habermas' theory of communicative action represents a critical synthesis of the leading sociological theories, primarily those of Parsons, Weber and Marx. On the basis of his analysis, Habermas builds a conceptual analytical apparatus of his new theory of society. In that sense, he elaborates the basic concepts such as social action, interests, life world, social system, regulation as communication. Regarding differences in the character of actions, Habermas distinguishes four forms of action, namely, 1. teleological action, 2. norm-regulated action, 3. dramaturgical action and 4. communicative action. He also differentiates the instrumental action from the communicative and emancipation actions. To each action type correspond various interests of the mind (theoretical interest, practical and emancipation interests). To each degree of the social development corresponds a degree of understanding social facts (knowledge), moral justification (legitimacy) and legal norms (regulation). If the development of these dimensions is not coordinated, the society is inevitably subjected to conflicts, crises and changes. In his theory of society, Habermas distinguishes the social environment or what he calls "the world of life" (in which man leads his everyday life by establishing more or less direct relationships with others) from social systems (economic, political, legal-normative) as specifically structured and institutionalized interaction patterns among people. In the history of human society, social systems grew out of the world of life. Their basic characteristic is to create the system dependence of people and groups and thus they appear as subjects in the political system, as clients in the public service ruling system and as consumers in the economic system. Through the controlling media (such as money, power, influence, value) the social systems affect human behavior, regardless of direct interaction and their individual personal interests. These system institutions narrow their rational range in time and become too narrow; in other words, they become factors of conservatism and social impediment, something we may be witnessing as we speak, to wit the tea party movement, and thus, they lose their legitimacy. They are dominated by money and power, bureaucratization and politics. Therefore, the main problem of modern society is "how to save the social world from the system structure onrush, that is, what conditions are necessary to ensure and develop the subject autonomy in the not-yet-conquered communities. According to Habermas, the way out is the affirmation of the "communicative rationality", in the strengthening of the civil society autonomy, in expanding the space reserved for free action and communication of people who, in mutual communication, bring about rational decisions founded upon rational argumentation and consensus instead of upon strengthening of authoritarian government forms and system enforcement. Following this line of thinking, Habermas also notes a progressive role of new social movements, stressing that conflicts in modern society move away from the production relation sphere into the domain of culture and politics. Habermas thinks that the existing forms of social organization, both capitalist and socialist ones, should be replaced by new organizational principles. Instead of the success principle or the solidarity principles, he pleads for argumentation and communicative action principles. This requires adequate prerequisites; most of all, it is necessary to abolish compulsion in communication; to develop universal communication ethics and establish adequate democratic procedures among people and social groups. In this context, what is essential is the role of the speech act in a communication process which points to contextual and other conditions as well as assumptions buttressing rational discourse. Echoes of Stuart Mills’ “freedom of speech and communication” can be detected here. However, when one compares Marx’s and Habermas’s social theories one notices some essential differences. Namely, Marx's paradigm relies upon "the idea of materialism in sociology", that is, upon the role of labor and production in social changes throughout history, while Habermas’s normative theoretical basis is speech and communicative action stressing the role of organizational principles and communication. The normative basis of Marx's theory is the value theory and the theory of exploitation and alienation. This is discarded by Habermas, while he continues to speak of alienation vis a vis privileges and deprivation. While Marx speaks about the historical role of the proletariat as a macro-subject in the emancipation process, Habermas believes that speech and communicative community both involve pluralism of actors, that is, all social layers and interests. While Marx speaks about revolutionary transformation of the class society into the classless one, Habermas writes about a lasting and gradual evolutionary correction of the existing state. Marx's project requires abolition of the multiple-party system, market, government division; Habermas, on the other hand, considers all these mechanisms valid once they are reformed; while Marx's project is put into a utopian perspective, Habermas's begins at the origins of human society. Here there are echoes of Vico’s and Heidegger’s originative thinking. Finally, Marx's project requires the creation of the “new man,” while Habermas's relies on what is already there, for better or for worse. There is a danger however in Habermas’ social theory which cannot be overlooked and it may be this: that the myth about philosophers-kings (probably incarnated only partially in Marcus Aurelius) and of ideal imaginative utopian states, as envisioned by Plato and Marx, may be repeating itself in this new communicative action theory. Nevertheless, despite this caveat, Habermas's requirements for the integration of diverse theoretical approaches and for a valid alternative to Marx’s social paradigm, represents a powerful challenge to all those who acknowledge the urgent need for more humane and inspirational social paradigms than the facile taken for granted market oriented ones that obtain presently in the Western world and even globally. "A European community grounded only in political and economic cooperation of the member states would lack an intrinsic common bond. It would be built upon sand." The above quote is lifted from a brilliant essay published in the Fall of 2002 by Klaus Held titled “The Origins of Europe with the Greek Discovery of the World” (reviewed in this very magazine in a piece titled “Klaus Held on Religion, Science and Democracy in European Culture”. The essay is a must read for anybody interested in exploring the very origins of European culture and concerned about its present trajectory and its future destination. Now that the whole Western world is in the midst of an unprecedented economic and refugee crisis, his words on the inadequacy of a mere economic vision with an attendant banal trade treaty parading as a constitution of sort, resonate with special vibrancy. Held insists throughout his essay that to forget the vital component of religion which was at the root of science and democracy’s appearance in ancient Greece is to understand precious little of what makes Western culture in general the unique culture that it is. This is a theme previously explored by Christopher Dawson (in his The Making of Europe, 1932; as well as George Santayana, an atheist, who holds that the enigma that is Europe will forever elude us without a clear and unbiased understanding of the phenomenon of Christianity, independent from its practice. Two years later, on June 9, 2004, that watershed article was followed by a report by the European Policy Center in Brussels drafted by a senior research fellow, Dr. Jocelyne Cesari. She reported that Europe is the only region of the world which has a general hostility toward religion; that Europeans have a tendency to explain every sign of backwardness in terms of religion. The European tendency, according to this scholarly report, is to equate Muslim religion, and indeed all religions, with fanaticism. This phenomenon unique to Europe was also documented by the World Values Survey conducted by a group of social scientists who identify its roots in the Enlightenment Period, the period of Voltaire, the very icon of Enlightenment who while asserting that he would defend to death the right of dissent and free speech of any citizen, at the same time, and paradoxically, writes the famed “Mahomet, of Fanaticism” in 1745, without ever retracting his misguided tract. In fact, he dies cursing Dante whom he considered a bigoted Medieval (Gothic was his favored slur) poet and therefore not a great poet. That anti-religious bias, according to Cesari and the World Values Survey lives on today. But there are signs that it is in abeyance. One who detects those signs is none other than the most admired and respected of present day German philosophers, Jürgen Habermas. He seems to detect what he calls a “post-secular” age on the European horizon. This has all the self-proclaimed secular humanists, who generally disdain religion and advocate its liquidation, a bit worried lately. In fact, their strident vitriolic proclamations against religion have been on the increase. For they have always fantasized of being at the very cutting edge of what it means to be modern and “enlightened” and now feel such a position challenged not only by theologians and religious leaders but fellow scientists. “Secular humanism” is certainly a misnomer which was certainly not invented by the original European humanists in 14th century Italy. Its acknowledged father, Francesco Petrarca, was a deacon of the Church; indeed most humanists remained practicing believers while appreciating Greco-Roman culture. Secularism by itself is in fact a neutral term distinguishing the sacred from the secular or temporal. Dante certainly made such a crucial distinction and placed three Popes in hell for failing to make it thus confusing the sacred with the temporal. On the other hand Humanism in itself does not indicate an unfriendly stance toward religion, at least at its origins in Italy in the 14th century. The modern fallacy consists in placing “secular” as an adjective before humanist as if to imply that to be a humanist one needs to be a secularist inimical to religion. It is not the case that all secularists (what the French and Italians call “laicitè” or “laicità”) are ipso facto atheists and agnostics unfriendly to religion. One of those secularists was Robert Schumann who is up for canonization by the Catholic Church, another was De Gasperi who was also a devout practicing Catholic, as were several of the EU’s founding fathers. On the other hand, we have a famous avowed atheistic scientist Richard Dawkins, who in his book The God Delusion asserts that “The God of the Old Testament is arguably the most unpleasant character in all fiction: jealous and proud of it; a petty, unjust, unforgiving control freak; a vindictive, bloodthirsty ethnic cleanser; a misogynistic, homophobic, racist, infanticidal, genocidal, filicidal, pestilential, megalomaniacal, sadomasochistic, capriciously malevolent bully.” One may object that the likes of Dawkins are mere aberration and therefore my argument against them is an ad hominem one, that I may be fighting straw men and windmills; to the contrary I would submit that they are examples of a type of “enlightened” modern prototypes ready to fantasize a bully God while at the same time denying his existence, convinced that the sooner religion is liquidated, the better. They are willing and ready to throw the baby out with the bathwater and eliminate the use and the practice of religion because of its abuses. Thomas Aquinas, among many other things, has taught us that the abuse does not cancel out the use. Jürgen Habermas, perhaps the most respected and best known present-day European philosopher, especially after the passing on of Derrida, must have surely read Held’s influential essay. Habermas is very much involved in the debate on the EU’s identity and has even signed manifestos on the same with Umberto Eco, the late Derrida and other influential philosophers. In 2005 Habermas delivered a lecture on the occasion of the Holberg prize which then became an article in 2006. See “Religion in the Public Sphere” by J. Habermas, in European Journal of Philosophy 14: 1-25. The core of that essay is that secular citizens in Europe must learn to live, the sooner the better, in a post-secular society and in so doing they will be following the example of religious citizens, who have already come to terms with the ethical expectations of democratic citizenship. So far secular citizens have not been expected to make a similar effort. Habermas addresses the debate in terms of John Rawls’s concept of “public use of reason.” At the beginning of the article Habermas introduces two closely linked ideas: on the one hand the increasing isolation of Europe from the rest of the world in terms of its religious configurations, and on the other hand the notion of “multiple modernities.” He challenges the notion that Europe is the lead society in the modernizing process and invites his fellow secular Europeans to what he calls “a self reflective transcending of the secularist self-understanding of Modernity,” an attitude that goes beyond mere tolerance in as much as it necessarily engenders feelings of respect for the world view of the religious person, so that their pronouncements don’t automatically engender derision and contempt a la Voltaire. In other words, Habermas while advocating reciprocity and the “public use of reason” in the agora and not in the privacy of one church or synagogue or mosque, is proposing a new challenging question: Are religious issues simply to be regarded as relics of a pre-modern era, or is it the duty of the more secular citizens to overcome his or her narrowly secularist consciousness in order to engage with religion in terms of what Habermas calls “reasonably expected disagreement”? That of course assumes a degree of rationality on both sides. It is indeed a challenging argument and constitutes an interesting response by an eminent philosopher to a fast changing global environment, one in which the relative secularity of Europe is increasingly seen as exceptional and unique, rather than a prototypical case. Being exceptional can be a positive trait when one is in pursuit of excellence (arête), but it can also prove culturally disastrous when accompanied by narcissism and hubris. Croce’s political thought, even if always connected to the problematic of freedom, because of the enormity of references and the questions he dealt with, did not create any particular interest in the liberal world. Croce’s adherence to Giolitti seemed more tied to a particular form of government than to a true ideology. In the same way Croce’s concrete political commitment first as deputy commissioner of the Municipality of Naples, as Senator, and later as Minister of Education in 1921, did not take on that tone that usually connotes the activity of a leader. Furthermore, and perhaps this is the most important aspect, Croce’s philosophy, his historicism, and Marxist and Hegelian origins, were somehow foreign to the classical tradition of liberalism which was clearly empiricist. The real turn came with the advent of dictatorship. After an initial phase of uncertainty, especially after Matteotti’s murder, Croce passed to the opposition, drawing up, at Giovanni Amendola’s instigation, the Manifest of the anti-fascists intellectuals and, later, with memorable speeches in the Senate, he became the voice of strong dissent of the Italian anti-fascist culture. He became the symbol of the moral and cultural resistance to despotism both in Italy and abroad. Once the war was over, he took part in the reconstruction of the Italian government and founded the Liberal party, of which he became the President. In these twenty-five years, in a variety of writings for various occasions, Croce elaborated what we could define as a more stringent acknowledgment of the themes tied to his philosophy of liberty. These are the years when the metapolitical theory of freedom was conceived, which introduced liberalism as a general conception of life, beyond the single economic, political and judicial doctrine that constituted the history of the liberal movement. Once liberalism is understood not only as an historically determined political movement but as an ethico-political expression of a general conception or idea of liberty, the traditional relations among the various political movements change. From what has been said in previous chapters, it will be clear why liberty for Croce, which is the ethical force that moves history in a perpetual struggle against negative value, against raw and green vitality, cannot be exhausted in this or that determined party, movement or specific doctrine. For instance, the doctrine of natural law has been a decisive movement for the affirmation of the rights to freedom for millions of men and women, but not for this reason it can be considered the sole liberal theory, the point of arrival, the goal of the struggle for freedom. If it were not so, liberalism would have exhausted its drive by having been, at least partially, realized and could have hardly resisted the many criticisms of its adversaries, by being transformed as a preservation force. Liberty and the unceasing struggle for its concrete realization, do not recognize similar limitations. Therefore, the terms of Croce’s polemic against Einaudi and Ropke, on the issue of whether liberalism could or should be identified with the so-called market economy or economic free-trade, result more clear now. 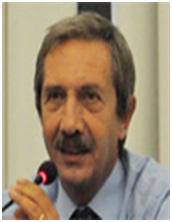 While Croce, in his concrete political life, never denied the importance of market economy, he could not but point out that freedom can, theoretically, co-exist with other forms of economy and, we could add that, unfortunately, a free-trading society does not guarantee in itself political, juridical and moral freedom. One can, I believe, assert with some confidence that history proved Croce right. Many examples from Statist and social-democratic Sweden in the seventies, to free-trading and authoritarian Chile of those same years, prove that freedom is not necessarily tied to an economic system. Free-traders, in some ways, make Marx’s same mistake by absolutizing economy as the sole motor cause of history. On the other hand, there are no pure economic systems. There are only concrete political economies that are subject to the always new and unforeseeable conditions dictated by history. Thus, one could define Croce’s liberalism as a methodological liberalism as is, after all, his entire philosophy that he calls a methodology of history. The term “method” can also help resolve many of the ambiguities created by the definition “metapolitical theory of freedom.” From here, in fact, derive the many misunderstandings and accusations of metaphysicism, abstracticism, and contempt for institutional empiricism. Unfortunately, the opposite is true. Liberals (and they are in the majority) who persist in elevating to a single liberal doctrine a particular political or economic program end up by abstracting from complex reality only a part of it. These doctrines are put forward in the schematic form of logical reasoning joined together and perfect in their form so that at first they seem extremely concrete because exact but, as we saw, they are really abstract. Another points needs to be brought to the attention of scholars and politicians. If liberalism so understood has a methodological value and is not a collection of doctrines put together ad hoc at a given historical moment and then arbitrarily elevated as eternal theories, if modern liberalism is this, it can dialogue and open itself up to comparison with other movements that do not pretend in their turn to be representative of the entire reality, transforming themselves in philosophies of history. This is the case of the socialist movement. Liberalism is extremely exacting when it is a question of contesting and contrasting even with force (which is not mere violence) any political movement that proposes implicitly or explicitly to limit liberty, but is prepared to recognize the reasons of the adversary and to make them its own when they do not contrast with the fundamental regulatory principles. In our example, if socialism abandons, as it has already done in large part, the old Hegelian-Marxist trappings, as Croce defined them once, and transforms itself (or returns to its origins, as Croce says) into a movement for social and political emancipation of the least well-off, the workers, the disadvantaged, it will be able and will have to cooperate with liberalism. This is Croce’s position and one should not be misled by the sharp and perhaps excessive polemics that he entertained with some representative of liberal-socialism and with some distinguished representatives of the Action party (azionismo), who moreover were often his pupils and his friends. These polemics, in fact, were dictated by contingent factors and by the exquisitely philosophical preoccupation of keeping the categories (liberty in this case) well distinct from the empirical concepts such as those of justice and democracy. Naturally, what has been said for socialism also goes for other ethico-political movements with the exclusion of those, it is worth repeating it, decidedly totalitarian. Similar remarks can be made with respect to the great question of party legitimacy. If liberalism is a method, a general conception of life, then the parties, and the so-called political programs, cannot be absolutized and immobilized. They are judgments not prejudgments , as the title of one of Croce’s famous essay goes. They are concrete and empirical formations that are inspired by an ideal, that represents interests that must conform, every time, to the always new concrete historical conditions. This mobility, which is not ambiguity, is the fundamental guarantee of liberty and democracy, and is the very foundation of responsibility, because an act is truly responsible if it is the result of a choice, and in those ideologies, in those parties that believe to be founded on absolute certainties, no choice is possible. Democracy can degenerate in totalitarianism if it absolutizes its principles by changing, for instance, the principle of majority in the tyranny of the majority. Therefore, Croce’s liberalism represents a novelty within the sphere of traditional political philosophy. Critical literature on the subject is still slight and only recently one begins to be aware of the originality and the force of this aspect of Croce’s philosophical activity, not to be seen at all as secondary. But the crisis lived by liberalism, almost dragged in the vortex created by the collapse of the opposed totalitarianisms of our century, communism and fascism, will be a stimulus to seek and certainly to find new and more secure roads. Croce’s thought, while perhaps producing aporias and certainly pointing out new problems, proposes itself as a secure reference point for those who intend to defend and extend the right of citizenship, the rights of the individual, and to preserve and promote the cause of liberty. Civilisations rise and fall, and at the beginning of the twenty first century, we find ourselves in a mature and overcrowded world, where most civilisations have their seen their best days while basking in the afterglow of their past among the crumbling walls, facades, and ruins wreathed with climbers and weeds reflecting on their former glories, and fighting like petulant children around the globe for the shrinking crumbs of resources; water, food, minerals, oil, steel, lumber, and using the long-term and short-term historical civilisational rivalries and conflicts as an immediate pretext for more conflict. It is in this environment that we find our modern Europe in, and its construction - the European Union - a Europe at the crossroads of its future; insecure and uncertain. A Europe that has constructed the European Union as a bulwark against its own dark shadows and potential evil that lurks under its skin like a Jekyll and Hyde; a Europe that is struggling to adapt to the conditions of the new world. A world with growing and burgeoning populations stripping the planet bare. In the Industrial age of man, where the plentiful bounty of the oceans are awash with paper and plastic. All swirling among the leathery green seaweed and the majestic sentinels of the sea; the whales floating like zeppelins in the deep. It is in this context that Europe finds itself; a world struggling to feed itself. Where a large proportion of nations in the world today are being ruled by authoritarian theocratic dictatorships, aristocracies and oligarchies that spark wars to keep and maintain power and control over nations and resources. That in turn sparks brutal internal civil wars and bloody civilisational wars; where even China - now that it finds itself a major power - is throwing its weight around in the South China Sea - to stake its claim to some submerged reefs, acting like a selfish imperialist power, while the tired, hungry and war-ravaged peoples of Africa, the Middle East and Asia try to escape their Sisyphian nightmares by seeking a delusional utopia that does not exist, escaping to the cloud cuckoo land that is Europe; to their imagined land of milk and honey. A Europe which is currently suffering one of the greatest economic stagnations in its history, of high and entrenched long term unemployment, decreased national incomes and increasing ageing populations and increasing budgetary costs for welfare and social services. A Europe that places the importance of capitalism, the banking system and entrenched interests over true democracy and freedom, liberty and equality; and the needs and wants of its fellow citizens. Yet before we attempt a deeper examination of the question of the future and identity of Europe, we have to undertake an excursus into the concept of democracy, and freedom in Europe today and whether they actually exist. While we ask these questions from the comfort of our couches, I wonder how the newly poor and disenfranchised middle and working classes of Europe would ponder these questions whilst sleeping huddled in cardboard boxes on street corners on cold windy nights in their hunger and misery while waiting for the soup kitchens to open in the morning, as the tattered rivers of refugees flow into Europe with stars in their eyes hungry to share the poverty and misery of Europeans? There are many questions that need to be asked and an honest self examination attempted to cathartically arrive at some truths. Yet here, a reflection also needs to be made on the concepts of identity and the modern nation state, and the outdated and anachronistic rightwing and leftwing political movements that have dominated Europe in the twentieth century and that are still sadly dominating Europe today. At present, democracy is being sorely tested in Europe, and the question has to be asked in fact whether it actually exists at all. Opposing forces and vested interests within the European Union are being pitted against the democracies and sovereignty of national governments. The creation of the EU has challenged the sovereignty of nation states. During the accession phase to the EU, accession nations conducted referendums, the public funding by the EU of the media was unbalanced and in favour of accession. The EU commission often interfered in favour of the 'yes' side in breach of EU law which gave the commission no competence in treaty ratification. Accession nations were in turn required to adopt into their own domestic laws over 80,000 pages of EU regulations and directives, and accession countries had no part in formulating these regulations and directives; many of these directives ran counter to the needs, wants and desires of each member nation. Membership to the EU has metamorphosed national government ministers and made them subordinate to the supranational level, where they can now bypass national parliaments and can now make laws and directives for 450 million Europeans behind closed doors in a thorough oligarchy of 25 persons on the EU council of ministers which as a body is responsible to nobody. EU nations and nationalities are a part of the international community and exist within the overall environment of globalisation and the supranationalism of bodies such as the EU. One of the fundamental rights of humanity and nations is the right to self determination as proclaimed as a principle in the French Revolution's declaration of the rights of man in 1789; which influenced other revolutions and many others since then remaining a basic principle of international law and enshrined in the charter of the United Nations. On reflecting on the concept of the nation state, a nation has always existed before the nation state has. Where nations have historically long existed in stable communities of people with a common language, sharing a common history and territory. Some nations are younger and some nations ancient, and they have developed mutual interests and self-identification, thereby distinguishing themselves from their neighbours. Such mutual solidarity and identification constitutes the 'Demos', the very people of a nation, its collective voice and will. The solidarities that ought to exist within nations, does not exist when they are in constant competitive tension with each other. The concept of the nation state is only a few centuries old, wherein the number of nation states at the UN has grown from 60 in 1946 to just over 200 today. The number of European states has grown since 1989 from 30 to 50, and the process has not ended and has scarcely begun in Africa and Asia where the bulk of people still live in clan based societies. Therefore the emergence of nation states is a historical logical extension of the various nations which have formed and melded in the crucible of human history. Globalisation has altered the environment within which nation states exist, but that has not made them out of date. Internationalism and not globalisation is the future road of interrelation of nation states. An examination of the EU finds that it lacks a national solidarity that could bind the EU nation states together, a solidarity that is non-existent, which therefore makes the EU project and the Euro untenable. For in the end, the EU is a creation of the powerful bureaucratic, economic and political elite, without the authority and popular legitimacy of the Demos while in fact, there is no European Demos, people or nation that can bind together the EU nations like the natural conditions that exists within a nation state. There is no EU common good, like that which exists within nation states. All the pseudo cultural and political symbols can be created to proclaim this fake EU solidarity; flags, anthems, charters and symbols. Yet at the end of the day, they all ring hollow and the nation state is and will be the dominant force and vehicle for the expression of a sense human community and solidarity, which was first born from the sparks around fires which our ancestors once huddled in groups which formed the first expression of our mammalian sense of family and kin. An examination of the nation state within the EU has also shed some light on other structural contradictions within the EU, where an important one is that of the monetary and fiscal contradiction that presently exists. The fiscal and monetary unity that exists within a nation state expresses the will of its people. In a nation state, a currency and fiscal union exists to distribute taxes and income from richer areas to the poorer ones, thereby balancing out the fiscal position of the nation for the good of all of the people. Yet this monetary and fiscal solidarity does not exist at an EU level, where the Euro scheme and fiscal policies deprives the weaker economies and poorer nations of the ability to compensate for the lower productivity, weaker economies and poor resource wealth. This inability of the richer EU nations to undertake fiscal transfers makes the viability of the EU project due to a lack of national solidarity questionable; this has been exemplified by the harsh treatment being meted out to the poorer Southern European nations by Northern European nations. The moment that EU states are no longer able to decide over their own laws and policies is the day they become subject states. Where at present, the EU has been surely but slowly reducing the influence of smaller nation states in decision making by limiting or abolishing national veto powers. The economic and political weight of bigger states influences policy to their favour. Due to nation states having surrendered a measure of sovereignty over to the EU, they can no longer decide on their own domestic matters and who have placed their futures into the hands of those who do not act in their interests and who are not even citizens. The separation of powers between the judiciary, executive and legislature forms the basis of democratic states and fundamental liberty. Yet the commission in the EU violates this, where the executive proposes laws as if it were a legislature, has judicial powers, can adjudicate in trade disputes and impose fines. Where ministers in national governments also occupy the roles of legislatures for Europeans as members of the EU council and where this council is beholden to no one but itself. This increase in power for ministers and prime ministers thereby becomes intoxicating and ends up transforming them into political Europhiles ignoring the will of their own people and overriding national decisions and directions in favour of the EU establishment. Where ministers on an EU council level then become the arbiters of the lives of the ordinary European; how they should live, how they should eat, what they should eat, how to govern themselves, how a nation wants to express itself. An oligarchy is defined as a system of power which is concentrated in the hands of a small number of people usually distinguished by wealth, family ties, education, royalty, religious and military control. At present, the EU is operating as an oligarchy under the sheep's clothing of a democracy; where European nations have the superficiality of having free elections, rule of law, free press and the active participation of citizens. Where one would think that EU nations follow democratic philosophy via direct and representative democracies, and where the supreme power is vested in the people equally, but that would not be the case here. We have a fundamental contradiction between the artificial supranational entity called the EU verses the nation state, where the nation state is a natural evolution and expression of the human condition as evolved through tribe, clan, city-state, nation and then nation state. whereas the institution of the nation state is not only the right form of expression of political organisation, but it has a much brighter and longer future ahead of it. Even though capitalism has its flaws, none the less, it has been successful since the industrial revolution in being able to lift masses of humanity from a primitive feudalism to prosperity, health, education, literacy and the highest civilisational development in creating leisure time for to enable man to develop the higher arts and sciences. Yet the dark side of capitalism is the pursuit of money and wealth for its own ends, and this selfishness clashes with democracy. For democracy and capitalism are not perfect fits; where capitalism creates vested interests and power structures totally committed to the creation and pursuit of wealth over the interests of the common citizen. In turn, nations will place the economic interests of capitalism first when dealing with other nations over other more important areas of national interest. Then we have world banks and supranational structures riding roughshod over the world maintaining the status quo for their own ends. The EU has become the most odious of oligarchies, and the more of it there is, the less freedom, liberty, equality and democracy the citizens of each EU nation will have. So what is the answer? The answer is in having less Europe rather than more of it, the reassertion of the primacy of nation states, the return to the fundamental ethics expounded first by Plato and Aristotle, and the moral inspiration from our Christian heritage , and the balancing of capitalism with another system which values humanism. A humanism stock exchange of sorts that gives value and financial credits to nations who have a surplus in qualities such as freedom, equality, ethics, morality and humanist thoughts. If the anti-democratic structure of the EU is not changed peacefully, them the will of the people will eventually express itself one day through violent revolt and revolution. Europe at present is burdened by the failed and antiquated political movements of the left and right who are blinded by the irrational subjective particularist and relativist ideals of their flawed educations which is a rejection of everything grand and intellectually beautiful in the traditions of humanism and the enlightenment. Politics swings either from the capitalist or fascist right, or to the deluded and myopic left political forces, who undertake historical revisionism and a rejection of the validity of universal truths. A perusal of the European media will find plenty of leftist commentators clasping hands in a circle swaying left and right singing kumbaya with flowers in their hair; spouting the most unacademic rubbish. We know the dangers of the right and their fascist progeny, they are a known entity, but the left is just as bad as the right and only their abolition and the rebirth of a new a new form of humanism will set the European citizenry onto the right road leading to wisdom and truths. We live in an overcrowded world with depleted resources unable to sustain the billions of people and the future generations to come, and it is only by seeing with clear vision the unpalatable truths and then giving voice to them that we Europeans have a chance to start asking some valid questions about our future by firstly admitting we are wrong and know nothing. Yet who today has the wisdom to destroy their egos to accomplish this? In Europe in the meantime, the world is focusing on the human rights of the Syrian refugees, but who is crying out for the loss of human rights of the European citizenry which is being trampled on by this monster called the EU? Europe has created many monsters from its dark shadows, imperialism of the nineteenth century, the fascism of Italy and Germany during the first half of the twentieth century which ironically were both results of the will and mass-mindedness of democratic citizens, and now the EU. It would do well here to complete our discourse by reflecting on the words of the famous German philosopher Friedrich Nietzsche who once stated: "He who fights with monsters should look to it that he himself does not become a monster. And when you gaze long into an abyss the abyss also gazes into you."